Written by: Hampton Fancher, David Peoples. Starring: Harrison Ford, Rutger Hauer, Sean Young, Edward James Olmos, M. Emmet Walsh, Daryl Hannah, William Sanderson, Brion James, Joe Turkel. Note: I believe I watched the 2007 'final cut', if that makes any difference. Okay. No, I hadn't seen Blade Runner before now. You can finally put the pitchforks down: it is crossed off my essential watchlist. Yet, you might wanna hold onto the pitchforks a little longer. Chances are, I probably didn't like it as much as you. Now, let me rephrase that: I did quite like the film. Hell, there were even parts that I loved about it. But let's just say this was more of an "it's not you, it's me" kind of situation. My aversion to both sci-fi films and 1980's films kinda let me down, hampering the entertainment sides of things. But while I may not have been fully into it, I could definitely appreciate it. Blade Runner is a fairly complex story, of the world as it would be in 2019. Set in Los Angeles, a few 'replicants' (human clones with fixed lifespans) have come to Earth to lengthen their lifespan, and must be 'retired' (in other words, executed). 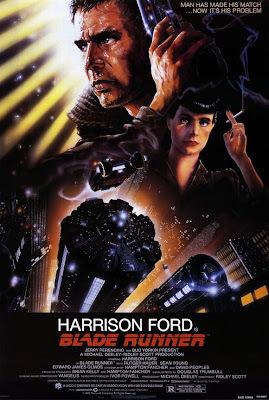 Rick Deckard (Harrison Ford) is a retired 'blade runner', who is put back into the force to retire these replicants. And yes, things just go forth from there. The film is nearing it's 30th birthday, and soon we'll be nearing the year in which it was set. I love watching futuristic sci-fi's like this, just because they had such an advanced vision for us that we probably won't be reaching by their set dates. Hey, a lot can happen in seven years, but I don't think flying cars are going to come for us any time soon. Immature thoughts on Blade Runner's future aside, I thought the art direction and special effects were perhaps the best that I've ever seen. Neon is certainly used a lot, which contributes to the dated look (neon was so 80's), but the lit up, claustrophobic atmosphere used in the futuristic Los Angeles is a sight to behold. In a world where these effects are achieved by using over-saturated CGI which usually doesn't look at all real, Blade Runner's effects are like a breath of fresh air. Ridley Scott's direction matches that, particularly in the wide shots where you see Los Angeles which are, for lack of a better description, mind-blowing. Jeez, if I saw this back in 1982, I would have probably had a heart attack or something. I think my problem with the film, though, was the narrative. The film, for the most part, ticked all of the boxes. But just as I was presented with this strange, complicated world, I never felt like the actual story matched up with that. The film has very odd pacing, which threw me on my first watch. I guess I was one of those people who was expecting a badass, action-packed film, which is certainly different to what I got. When I first watched the film (a week ago), I found it hard to appreciate it, but upon a second watch, I started to get a little more involved with it. The themes of humans without emotions was quite interesting, and one I'd probably get even more invested in if I watched it again. But as it was, I found it extremely hard to get emotionally invested in the film, which is something that I always search for - because I'm old-fashioned like that. Mind you, the ending (which I understand is different depending on what version you watch) was pretty darn cool, I thought. That final line - "it's a shame she won't live, but then again, who does?" - sends shivers down my spine. However, it is easy to see the influence that the film has had on some of the films we see today. It is complex and visceral, and often delving into the dark side. It is an important part of film history, becoming a definitive, yet very different part of the science fiction genre. Yet, while it's influence does seep through into today's films, I don't think anyone could make a film like it. It is the kind of film that was great for when it was made, but got even better as time went on. While I'm hesitant to say things like "this is the best movie I've ever seen! ", there's no denying that this is an important film. My appreciation towards it doesn't know any bounds. Alas, it doesn't go much further than that. Come back to me in a few years. I have a feeling that great things take time. Well I didn't love it the first time I saw it either. But I've seen it twice since that, and I absolutely love it now. Big reasons for that is I love dystopian stuff, I love love love Harrison Ford, then the look, the villain and the noir aspects are brilliant. I love dystopian stuff too! I really should have done that for my assessment...but I'm happy with my 1920's theme, just so I can read F. Scott Fitzgerald. I think Blade Runner is a film that, like you thought (about it growing on you), I'd have the same reaction too. I thought that, for sure, it would become one of my favourite films when I watched it a year and a bit ago (I love sci-fi and film noir) so it was a dead-set, but, in the end, I was left out in the cold a bit. However, it is definitely one of the most beautiful looking films I have seen, and at some point I am going to give it another shot. Yeah, that's what kinda happened with me. I thought I'd be like "omg, favourite film ever! ", but I was kinda just like "eh...". Time will tell, though. Yeah, it is definitely beautiful. One day I should make a list of the most beautiful films I've ever seen. You should definitely do a list like that! But you've got to watch In the Mood for Love, Lust Caution, Peeping Tom and Orpheus first! In the Mood for Love is probably in my letterbox right now! Blade Runner is one of my faves! I would put up against any of today's CGI blockbuster films. 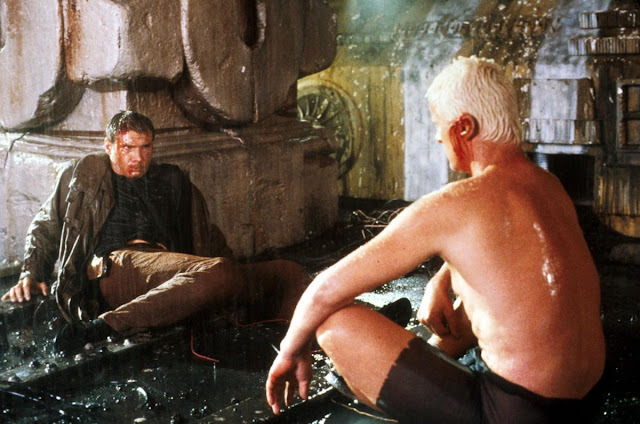 Blade Runner's effects were so ahead of it's time and they still look amazing today! Good review Stevee! The effects were definitely ahead of it's time! They were amazing! Which version of it did you see, though? There are marked differences between the as it was released in 1982, the so-called director's cut from ten years later, and the so-called final cut from a few years ago, all of which have an accordingly different feel. Although, having said that, I remember being in a film studies class at uni in 1995, we were going to watch Blade Runner in that, and the lecturer asked us if we'd seen it before or not and if so which cut. Turned out I was the only person in the class who'd seen both (at the time) versions, cos I'd seen the original either on TV or video before the 1992 version came out. So I got asked which of the two I preferred, and, well, I still recall the general horror when I said "neither". I hadn't really liked the original, though I was probably not old enough to get it when I saw it... but I was older when I saw the director's cut, and I still didn't like it. I liked it better when I saw it again a few years ago, though I still think it's overrated. Haven't seen the final cut, but can't imagine it'd really change my mind that much. I saw the final cut from 2007, I think. It is pretty silly that it has so many versions - I mean, I get the thinking behind it, but how much is too much? I definitely get what you're saying...it is one of those films that you feel you have to like. If I had written this review last week when I didn't really get it, I probably would have been the most hated young one on Earth. When I tried to watch it at first, something was not working, so I decided to see it some other time. And man, it was a great decision for I loved it when I settled down for the second try. The film look is so astounding and you put it right: watching it in 1982 would have been heart-stopping. Just like you, I also expected more action, that's probably why the first take was not successful with me. Anyways, a thrilling film. Definitely ahead of its time, like many suggest. Yeah, I'm definitely on the same page. It really is ahead of it's time - apart from the cheesy music I couldn't believe it was made in 1982! I admit, I find it confusing to see which version to see. I saw the 1992 Director's Cut and really loved it. I heard the Final Cut version is the one with some of the new CGI and additional reshoots that Ridley Scott did for that version. For me, I think the reason I got into it immediately wasn't just the fact that it had something that looked really remarkable visually for its time. It was the story that I was really into. Maybe a re-watch will be needed as I'm yearning to re-watch again myself. I should check out the other versions. If they are easy enough to come by. I think I'd get more into the story upon another watch, but in a few years. I'll admit I'm not the biggest fan of this one either. As a science-fiction film, it's a classic, but I just don't love it. I will be informed lots of new stuff right here! to say that I've really enjoyed browsing your blog posts. After all I will be subscribing to your rss feed and I hope you write again soon!